Palm Gateway ... set to get off the ground. The Palm Gateway in Dubai’s prestigious Palm Jumeirah will offer 1,265 luxury apartments in three high-rise buildings. Dubai master developer Nakheel has awarded construction contracts worth nearly Dh1.5 billion ($408 million) for The Palm Gateway, a new, three-tower residential, retail and beach club complex at the foot of the Palm Jumeirah. Shapoorji Pallonji Mideast, the regional arm of the Indian business conglomerate Shapoorji Pallonji Group, has been signed up to carry out the work, which will begin shortly. The Palm Gateway includes 1,265 luxury apartments across three high-rise buildings – the tallest topping 285 m – to be constructed on top of the existing Palm Monorail terminal, which includes 14 levels of parking spaces. 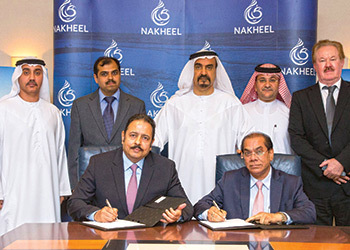 Units range from one to three bedrooms and will be available on lease, says Nakheel. 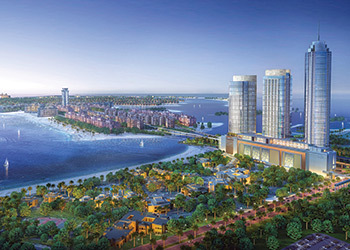 The waterfront living and leisure complex, set in extensively-landscaped grounds, will also have an abundance of retail, dining and health and fitness facilities, including parks, pools, and sports courts. The Palm Gateway will boast convenient transport links to other parts of the island and to the rest of Dubai. The Palm Monorail, which will remain operational throughout the construction of the project, is already connected to the Dubai Tram and the Dubai Metro, giving residents and visitors easy access to alternatives to the car. Officials sign the construction contract. With panoramic views of Palm Jumeirah, the Arabian Gulf and some of Dubai’s most famous landmarks, The Palm Gateway will also have its own beach club and park – a shaded, landscaped complex with a diverse range of waterfront dining and shopping options, pool, barbecue areas and fitness facilities, including a jogging track. The project will take two-and-a-half years to complete. Shapoorji Pallonji Mideast, he states, has been active in the region for the more than 45 years, delivering a range of prestigious projects. According to Nakheel, the Palm Gateway is one of a number of new projects in its growing residential leasing portfolio, which is set to double to more than 35,000 units, with other new developments coming to Palm Jumeirah, Warsan Village, Jebel Ali Village, Dragon City, Ibn Battuta Mall and Nad Al Sheba. The Palm Gateway is one of three high-rise developments by Nakheel on Palm Jumeirah. The Palm Tower, a 52-storey luxury hotel and residential complex at the centre of the island is under construction, while Palm 360, a 220-m twin-tower penthouse, apartment and hotel complex, is currently being designed.